Caitlyn's Story - You CAN Go the Distance! Caitlyn was a very cute, outgoing, but slightly overweight, 6th grade girl, who very much wanted to be on the Middle School Cross Country team. Her primary motivation for wanting to be a part of the team, as is the motivation for many young people, was because many of her friends were going to be on the team. Caitlyn had a problem, though. It’s called self-doubt. She had never been very athletic, and because of her weight, she was convinced that she would never be able to run the entire 3.1 mile course. How do I know that? She told me! “Have you ever tried?” I asked her. “No,” she said looking at the ground and with a slight quiver in her voice. “Then how do you know you can’t do it?” I countered. “I just know I can’t.” She said, moving some dirt with her foot. I don’t think she believed me, but we walked over to where the rest of the team had gathered near the front of the school. I talked with the kids about Cross Country running and explained that, today, we would go out to learn the course. They could run, jog, walk, at any pace they wanted, but we would go the full distance of the course. As we all started out, I asked Caitlyn to stay with me and told her we would run the course together. I told her I would stay with her the whole way and that it didn’t matter how fast or slow we went, so there was no pressure. As is typical for most kids—most runners, in fact—some of the pack went out really fast and got far out ahead of Caitlyn and me. What was happening was this: while she was completely caught up in whatever story she was telling me, we were passing other kids who were now walking and out of breath. We just jogged right past them and she did not even notice! Some of the kids we passed were the same kids who had gone out in that initial fast pack—the same kids she said she could never keep up with! “Oh, OK” she said, smiling, and walked over to the water cooler to get a cup of water. More kids had come up behind us and were gathering with our group. They were drinking and talking and giving each other fist-bumps and high-fives while still catching their breaths. After she had had a few cups of water, I asked Caitlyn to come over to me. “What… No, what did I do?” she said with a look of concern on her face. “WHAAATTTT?!!! !” she gasped, putting her hands up to her mouth in shock. She just started jumping up and down with her hands still over her mouth. For the first time, maybe in her entire life, she was unable to speak! She had tears running down her cheeks and wrapped her arms around me and hugged me tight. “Thank you, thank you, thank you! !” she said, looking up at me with tears still in her eyes. You see, all of life’s treasures are guarded by fear and self-doubt. The hardest part of doing anything new is finding the courage to decide to at least try. Confidence is something that only comes with experience. It’s OK to be scared. Do it scared. It’s OK to doubt your ability. Do it with doubt. You’ll never know if you can if you don’t try. It makes no sense at all, when you stop to think about it, how we are so afraid of trying something new because we don’t think we can do it. Seriously, think about it. We cannot do anything we have never tried before, until we actually try it! We do not know how to do anything until we try to acquire the knowledge and skills needed. “What… No, what did “WE” do?” she said with a look of concern on her face. Keyarnta, I’m very glad to hear this has helped you! Thank you for sharing! Great chapter! 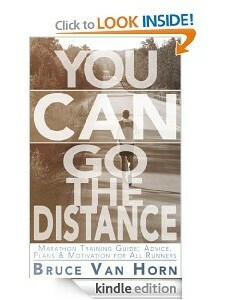 I can already see that this book is not only applicable to running, but also to life! When reading Caitlyn’s story I was reminded that when my daughter and I run we talk the entire run. It’s like when the run is over we are thinking, “We could have gone longer.” Running chats are awesome!